BONUS! Get the floor plan Rich used in designing his home. Rich Kinsman shares an update on his new home, and why “slow and steady” is a winning approach to building your dream home. 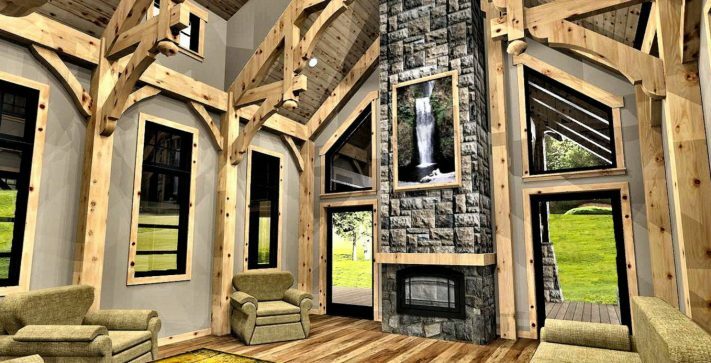 If there is one thing Rich Kinsman knows about creating a custom log or timber frame home (and as our Vice President of Sales, he knows a lot), it’s that you can enjoy the journey, not just the destination. At the end of every Confederation build is a gorgeous home or getaway you, your family and friends can enjoy for years to come. The destination is amazing; that’s a given. But Rich knows that, with the right perspective, getting there can be half the fun, even with a few bumps in the road. “Building a home is an adventure from start to finish,” he says. See more of this home by requesting The Revelstoke floor plan (bottom of this article). And, he would know. If you’ve been following along with Rich’s story, you know after selling his first Confederation custom home last year, he began making plans to build a new home for his wife and two young children. Then, property approval issues happened, and he went back to the drawing board. Their first Confederation home was made of logs. This time, they’re going timber frame. The blueprints, now in hand, reveal an artful mix of timbers, stone, siding and glass on the exterior, creating a striking first impression. Inside, an open concept dining, kitchen and living area set the stage for family life. A sunken living room creates visual interest and a cozy, comfortable space for relaxing with family and friends. Two bedrooms on the main floor, a master suite upstairs and two bedrooms in the basement create plenty of room for privacy for family and weekend guests. The bright and airy walkout basement — “the ultimate family cave,” says Rich—also includes a recreation room, theater, two additional bedrooms and a utility room. And of course, those extra bedrooms could just as easily become a home gym and an office. 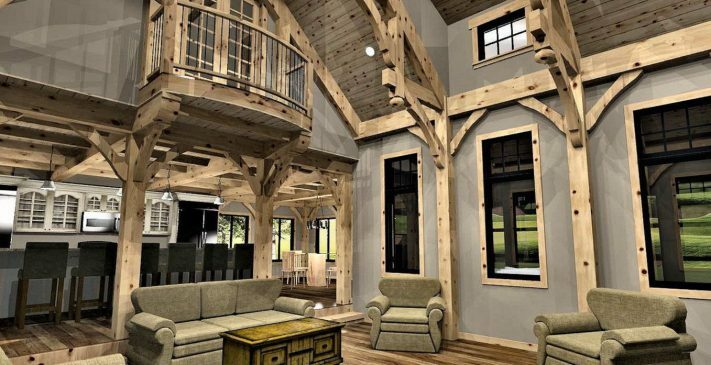 Eye-catching timber features abound throughout the three floors and exterior spaces: a covered entry and deck with live edge tree posts, soaring cathedral ceilings, a Juliet balcony above the great room and decorative gable trusses, to name a few. With their dreams on paper, the waiting game began … again. “You never know exactly what you’ll run into when it comes to approval issues with the permitting process,” Rich says. “There are a lot of people involved: the local municipalities, township, county. That’s why the best piece of advice I can give—in bold, all caps, underlined and with exclamation points—is to START EARLY! It’s no secret anyone building a custom home can benefit from an extra measure of patience to help sail through things like permitting setbacks and weather delays. But what may be a surprise is that working additional breathing room into your project timeline can actually benefit your build. Here are some reasons why Rich believes a slow and steady approach is a good thing. 1. Perfection comes from planning. Rushing through the design of a custom home will almost certainly result in regret down the road. That’s why here at Confederation we will never hurry you through the design process. We want you to take your time so that the end result is exactly how you envision it. Some say practice makes perfect. We say planning makes perfect. We offer a tried-and-true, two-step design process that includes 3D snapshots and a real-time 3D walkthrough. Does it take extra time to include those steps that the other guys don’t offer? Sure it does, but it also ensures you can feel 100 percent confident about your home’s floor plan. 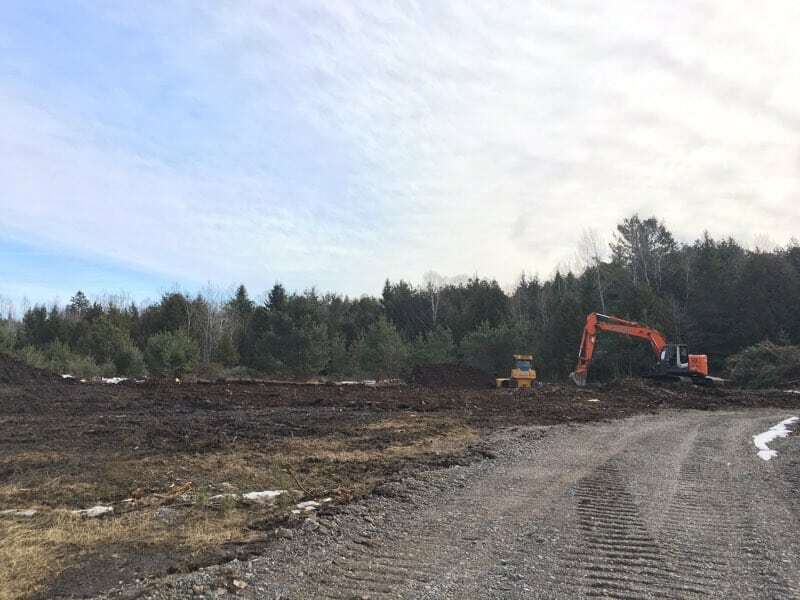 Clearing the lot for construction! We don’t think of our homes as just a product, it’s a service; a custom design service included in your package. It just makes sense to give yourself the time to make the most of that advantage. 2. Clear communication is key. Not only have Rich and his wife had time to firm up their own desires for their future family home, they’ve had ample time to express their vision. They’ve spent hours refining their plans with Confederation’s team design team. And, whether you are our Vice President of Sales, like Rich, or brand new to the Confederation family, you can expect the same level of attention. In the world of home building, clear and specific communication minimizes mistakes and last-minute changes, which is why we make it our business to listen closely to your needs and wants from the first consultation to move-in day and beyond. 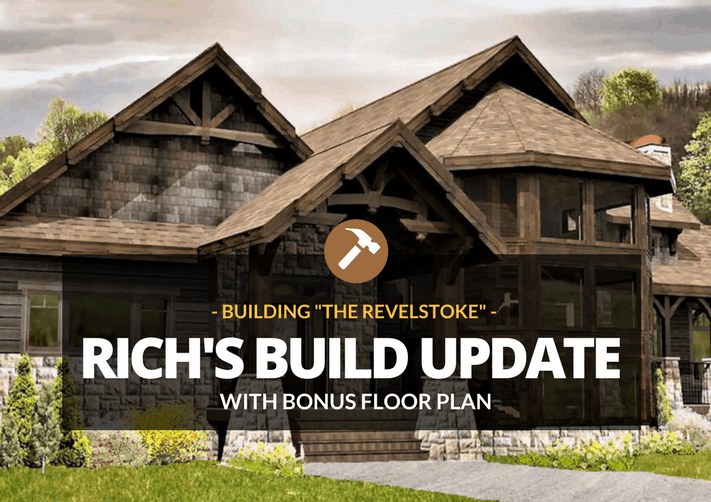 Want to know more about Rich’s floor plan — or, better yet, see it for yourself?